There is a diverse range of timekeeping technology solutions available for your business, which your human resources department will thank you for. The old punch in, punch out time clocks are now mainly a thing of the past within businesses. Computerised time and attendance systems are now widely used in most businesses, they are easier to use and can give detailed information of employee absences and breaks from the office. Business timekeeping technology has come on in leaps and bounds since the old time clocks were phased out in most businesses. The new timekeeping technology has become an integral part of most businesses. 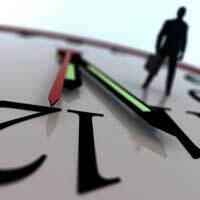 Not only can employee timekeeping information be easily accessible, these automated systems can also reward and penalise employees for their timekeeping behaviour. The range of timekeeping applications is diverse and it is important that businesses choose the correct hardware and software to meet their requirements. Real time tracking, viewing and reporting of employee information. Avoids clerical and administrative time recording errors. Can be integrated with payroll software packages.Reduces unnecessary overtime throughout a business. Accurately tracks all breaks and absences. Can be software only implementation meaning no hardware necessary. Can also be implemented with employee ID badges or biometric employee ID adding to higher levels of security. Reduces arduous admin tasks such as recording and calculating each employee's timekeeping record. Automated timekeeping is not expensive to implement and will be cost effective in the long run. Basic timekeeping systems including all software and hardware can be bought for less than a thousand pounds, although this technology can also be leased. In terms of unnecessary overtime, staff efficiency, and decreased admin labour this technology will pay for itself within a very short term. There are a number of different options available to businesses when it comes to this technology. The size of the employee workforce will make a difference and whether or not the business has a human resources department. In some businesses each department is responsible for their own staff timekeeping records. If this is the case then dedicated timekeeping software for each department may be the answer. If the business is large then hardware placed at the business entrance that records data with swipe cards when employee’s clock in and out will no doubt be more suitable. A great number of timekeeping technology software will come with extra modules that can be of benefit to a human resources department. Job costing solutions, employee specific databases and integration with payroll systems can all be added on. Some companies will charge for these extra modules but many will supply them free of charge with the initial software or hardware. There are a host of companies that can be found on the internet that provide timekeeping technology solutions. Most of these companies will provide CDs or downloadable material that can help businesses make the best choice when it comes to this type of technology. Shop around and choose three or four different companies to see which one can provide the best technology to meet your requirements. Employee time tracking and time recording can be an arduous task for any human resources department or individual department managers. Timekeeping technology will take the stress and strain out of this task, will be more efficient and will reduce timekeeping errors. Most businesses should recognise that this technology is an essential and cost effective business tool.